Last night the first Blue and Gold banquet for my son's Cub Scout troop. Our job was to bring a cake. 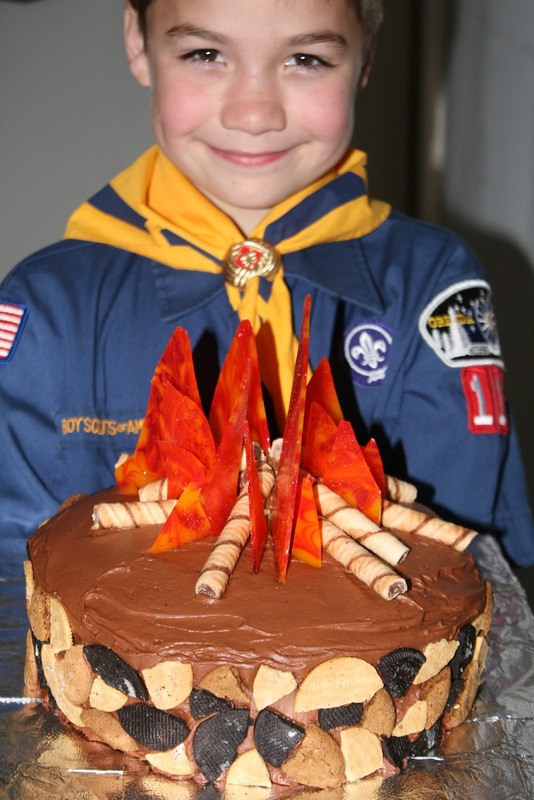 We thought it would be fun to make this campfire cake. Start with a round, frosted layer cake. We made a chocolate cake with chocolate icing. You can use yellow cake with chocolate icing or whatever you choose. I used a cake mix and made homemade frosting. You can use canned frosting if you choose. Unwrap 12 cinnamon candies and 12 butterscotch candies. Place them in a thick freezer bag. Hammer with the smooth side of a mallet. The candies should look a little like this. Place in an oven heated at 350 for 6-8 minutes. The candies will melt together to make one sheet of candy. I ran a wooden skewer through the melted candy to give it a flame-ish look. When the candies are completely cool, poke with a knife point to break. While candy is cooling, prepare the cookies. I used Oreos that are vanilla on one side, and classic chocolate on the other; I also used gingersnaps and Pirouettes. Break up the gingersnaps and Oreos (remove cream filling). Place the broken cookies around the base of the cake so it looks like stones. Break off about an inch of each of the Pirouettes and place around the cake. Then assemble the candy between the Pirouettes so it looks like fire. Done. A work of art! 1 Response to "Blue and Gold"
We must be sisters! Funny thing is, Chase and I are making this exact cake for our Blue and Gold tonight! The candies are in the oven as we speak.